You will receive electronic copies of Canada's Best Training Instruction Book(s) in PDF format via e-mail within minutes of processing your order. These books can be easily downloaded to most desktops, laptops, notebooks, tablets, eBook readers and I-Phones. For the Hockey Made Easy Tips Web Site, you will receive an e-Mail with instructions on how to access the web site which has 80 + video and written tips on how to play better hockey. from Monday - Friday. Please have your credit card and contact information ready. To order 24/7 please fill in the following form and submit. Hockey Made Easy Tips web site you have ordered. You must complete all required fields in this order form to receive the selected Hockey Made Easy books or manuals or access to the Tips web site. The 48 page, "Coaches Practice Guide" is for minor and youth hockey coaches of players 5 - 12 years of age. 160 KB It describes how to run organized practices by rotating small groups of players for different skill instruction using hockey drills and controlled scrimmages. Selection of Assistant coaches, yearly practice plan overview, 6 complete practice plans, and includes a player evaluation form for forwards, defencemen and goalies. The 30 page, "Parents and Coaches Teaching Guide" can be taught either at home by a parent, at a the rink or a gym by a minor youth hockey coach. Suggested for boys and girls hockey players 5 - 12 years of age. 369 KB This guide is used for teaching young male or female House League to “AAA” players the skills and rules required to play hockey correctly and safely in just 5 easy sessions. The 35 page, "Hockey Seasonal Instruction Training Plan for Minor/Youth Hockey Coaches" 458 KB. Includes running a successful training/tryout camp, skills evaluation and selection of players, teaching basic and complicated skills over the course of an entire hockey season, playoff preparation and a winning strategy. The 17 page, "Secrets of Scoring Goals" 1562 KB . Includes detailed instructions and diagrams on how to shoot a wrist shot, snap shot, one time slap shot, backhand shot, flip shot, shovel shot, penality shot, shoot outs and wrap around round shot. 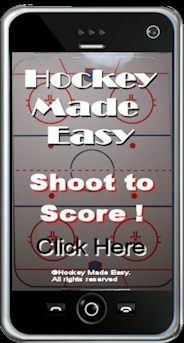 Scoring secrets - best angles to shoot from, shooting mechanics, tips to help your teams score more goals, secrets for scoring goals, best shooting and scoring areas from on the ice, best scoring locations from on the goalie and a variety of scoring plays. To acquire access to the Hockey Made Easy Tips video, written tips and drills web site. Upon completion of processing of the order the purchaser will receive an e-Mail with instructions on how to access the Hockey Made Easy tips web site which contains 80 + video, drills and written tips for coaches, parents and players. To acquire access to the Hockey Made Easy Coaching Tools for Smart Phones and tablets which includes 50 + ways to score goals. Upon completion of processing of the order the purchaser will receive an e-Mail with instructions on how to access the Hockey Made Easy "Shoot to Score" web site which contains 50 + white board diagrams and instructions on how to score for coaches and players. Please call 613 342 0639 with your order information. Prices are subject to change without advanced notice. Prices are subject to and can change without notice.